SUEZ and the New York Chapter of the National Association of Water Companies (NAWC) have announced the recipients of the 2017 student scholarships. 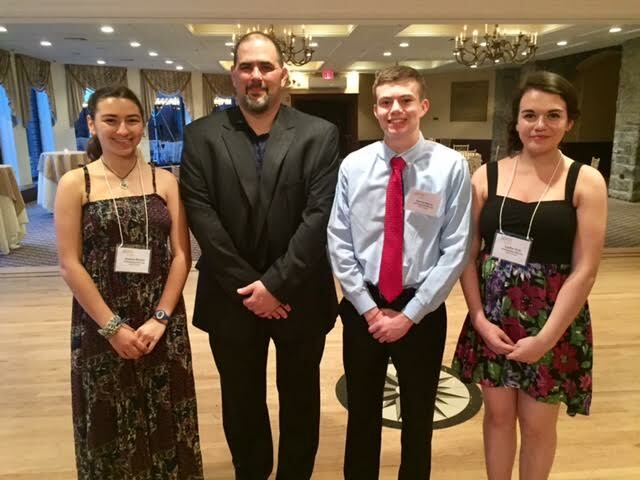 The $3,000 scholarships will go to Daniel Henry (Tappan Zee High School), Caitlin Holt (Pearl River High School) and Jessica Minker (North Rockland High School). The scholarship is designed to assist high school seniors who will pursue degrees related to the water industry and the fields of science, technology, engineering and math (STEM). The winners were honored at an awards dinner at the Hotel Thayer in West Point. Daniel Henry, of Orangeburg, attends Tappan Zee High School where he is a member of several honor societies and received perfect grades on the Global and American History Regent exams. He is captain of the varsity cross country team and a member of the winter track and lacrosse teams. Daniel also volunteers with the Buddy Ball program which provides sports opportunities for children with special needs. He will be attending Villanova University where he will study biology. Caitlin Holt, of Pearl River, attends Pearl River High School where she has an exceptional academic record and is a member of several honor societies. She has held leadership positions in many organizations including the Model United Nations Club and Girls International Club. Caitlin is first violin in the high school orchestra and studied at the New York City School of Ballet. She is headed to Harvard to study international law. Jessica Minker, of Stony Point, attends North Rockland High School. She is class valedictorian and a member of several national honor societies. Jessica is founder of North Rockland’s Environmental Club and a member of the tennis and golf teams. She volunteers as a therapeutic horseback riding assistant at Camp Venture. Jessica will be going to Brown University where she will study environmental geoscience.